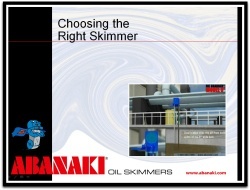 Thank you for requesting our Choosing Your Oil Skimmer Webinar. This 12-minute video tutorial is a comprehensive guide to sizing and selecting the appropriate oil skimmer for your application. Fill out the form and have immediate access to the webinar.